Hey look, there’s a new category on the Jamf Marketplace, available at https://marketplace.jamf.com/apps/#category=AppConfig,selecting the AppConfig category. The new AppConfig category gives administrators of any MDM that supports AppConfig access to a set of apps that support AppConfig. If you have an app that isn’t listed here, feel free to let me know. What does this mean? Well, AppConfig is a way of sending data into an app. App config allows a customer to deploy settings into applications on iOS devices in much the same way that settings can be sent into a Mac app via the defaults command. This means an end user could get an app installed on their device from the iOS App Store, a custom app, or a B2B app and that app would have any settings the user might need to connect to servers or configure the experience. 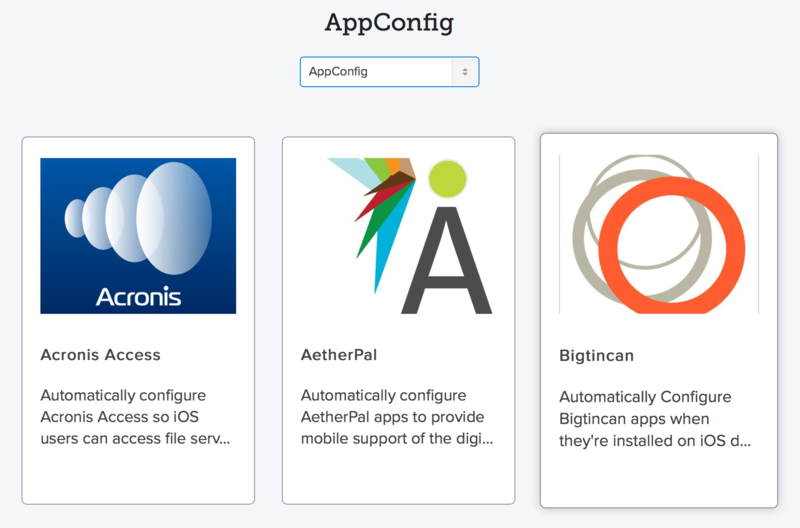 So what is Managed App Config? At it’s most basic, you identify a label and a value in XML and send it to an iOS device that’s running iOS 7 or later (e.g. via Jamf 9 and up). The vendor who makes the app has to basically define what those settings are. Which brings up an interesting problem never fully addressed with defaults domains: standardization and ease-of-use (although MCX was close). To see a list of apps that are available, check out http://www.appconfig.org. Managed App Config options are set by vendors at compile time within the code and then the XML sent with the app is parsed by the app at installation time. If you’re a software vendor who wants to get started with AppConfig, check out the Spec Creator from Jamf Research or get in touch with the developer relations team from any MDM vendor. If you’re a customer of an app and would like to leverage Managed App Config and your vendor isn’t listed on the appconfig.org site, get in touch with them, as this is the future of app management and chances are that you won’t be the only organization looking to unlock this type of feature. Let’s look at how this actually works. The Managed App Config options per supported app are available on a feed. The feed is available at http://d2e3kgnhdeg083.cloudfront.net. Here, as follows, you’ll see a list of all of the apps supported. You can then copy the path for an app, such as com.adobe.Adobe-Reaser/1/appconfig.xml and append it to the end of the URL to get the feed for that specific app. You can test this using http://d2e3kgnhdeg083.cloudfront.net/com.adobe.Adobe-Reader/1/appconfig.xml to see output as follows. Here, note that most of these fields are key value pairs defined by Adobe (in this example at least). You can enable or disable features of Adobe Reader using these keys. The same is true with a tool like Box that might want a more granular collection of settings than a feature like Managed Open In. 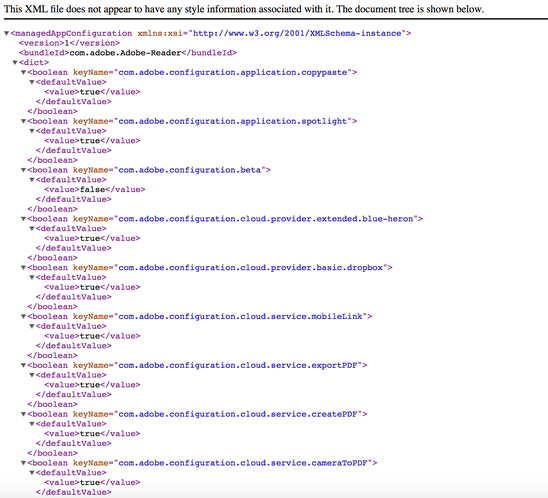 Once you have the XML, you can then copy it to the clipboard and paste it into the App Configuration tab of an app, as follows. Finally, Apple has sample code available at https://developer.apple.com/library/content/samplecode/sc2279/Introduction/Intro.html. When you’re regression testing, you frequently just don’t want any delays for scripts unless you intentionally sleep your scripts. By default Safari has an internal delay that I’d totally forgotten about. So if your GUI scripts (yes, I know, yuck) are taking too long to run, check this out and see if it helps: defaults write com.apple.Safari WebKitInitialTimedLayoutDelay 0 With a script I was recently working on, this made the thing take about an hour less. Might help for your stuffs, might not. If not, to undo: defaults delete com.apple.Safari WebKitInitialTimedLayoutDelay Enjoy. If we used a tool like defaults, plistbuddy or plutil to manually augment one of these accounts, we’d also need to kill accountsd as we did earlier. I’ve written a couple of articles about the Caching service in OS X Server 5 for El Capitan. As of OS X Server 5, the Caching service now caches local copies on the computer running the Caching service of iCloud content. This allows you to cache content once and then have it accessed by multiple devices faster. I’m torn on this option. On the one hand, I love the fact that I can cache things and on the other hand I find it frightening that a random user can cache things I might not want them to cache on behalf of another user. I know, I know, they’re encrypted with a device key. But when you have data on disk, it can always be decrypted. I almost feel like there should be a plist on machines that whitelists allowed caching servers. Maybe I should make a feature request on that. Either way, as it stands now, I might be disabling this option in larger offices. To do so, I can write an AllowPersonalCaching key into the Config.plist file at /Library/Server/Caching/Config/. The most graceful way to do this is using the serveradmin command, followed by the settings verb and then caching:AllowPersonalCaching option, setting that equals no, as follows: sudo serveradmin settings caching:AllowPersonalCaching = no To turn it back on: sudo serveradmin settings caching:AllowPersonalCaching = yes This can also be done by dropping a Config.plist file into the correct location for new server installations. I’ll have an article out shortly on doing so, as you’d want to normalize a few options in the file before deploying en masse (e.g. if you have a large contingent of Caching servers to manage. Configure the firewall fully before turning it on (especially if you’re doing so through something like Casper, FileWave, Munki, or Absolute Manage where you might kick yourself out of your session otherwise). Whatever you do, you can always reset things back to defaults by removing the com.apple.alf.plist file from /Library/Preferences replacing it with the default plist from /usr/libexec/ApplicationFirewall/com.apple.alf.plist. Configure global settings, then per-application settings, then enable the firewall. If a remote system, do ;wait; and then enable the first time to make sure everything works before enabling the firewall for good. In /usr/libexec/ApplicationFirewall is the Firewall command, the binary of the actual application layer firewall and socketfilterfw, which configures the firewall. To configure the firewall to block all incoming traffic: /usr/libexec/ApplicationFirewall/socketfilterfw --setblockall on To see if block all is enabled: /usr/libexec/ApplicationFirewall/socketfilterfw --getblockall The output would be as follows, if successful: Firewall is set to block all non-essential incoming connections A couple of global options that can be set. Stealth Mode: /usr/libexec/ApplicationFirewall/socketfilterfw --setstealthmode on To check if stealth mode is enabled: /usr/libexec/ApplicationFirewall/socketfilterfw --getstealthmode Firewall logging: /usr/libexec/ApplicationFirewall/socketfilterfw --setloggingmode on You can also control the verbosity of logs, using throttled, brief or detail. For example, if you need to troubleshoot some issues, you might set the logging to detail using the following command: /usr/libexec/ApplicationFirewall/socketfilterfw --setloggingopt: detail To start the firewall: /usr/libexec/ApplicationFirewall/socketfilterfw --setglobalstate on While it would be nice to think that that was going to be everything for everyone, it just so happens that some environments actually need to allow traffic. Therefore, traffic can be allowed per signed binary. To allow signed applications: /usr/libexec/ApplicationFirewall/socketfilterfw --setallowsigned on To check if you allow signed apps: /usr/libexec/ApplicationFirewall/socketfilterfw --getallowsigned This will allow all TRUSTEDAPPS. The –listapps option shows the status of each filtered application: /usr/libexec/ApplicationFirewall/socketfilterfw --listapps To check if an app is blocked: /usr/libexec/ApplicationFirewall/socketfilterfw –getappblocked /Applications/MyApp.app/Contents/MacOS/myapp This shows the number of exceptions, explicitly allowed apps and signed exceptions as well as process names and allowed app statuses. There is also a list of TRUSTEDAPPS, which will initially be populated by Apple tools with sharing capabilities (e.g. httpd & smbd). If you are enabling the firewall using a script, first sign your applications that need to allow sharing but are not in the TRUSTEDAPPS section by using the -s option along with the application binary (not the .app bundle): /usr/libexec/ApplicationFirewall/socketfilterfw -s /Applications/MyApp.app/Contents/MacOS/myapp Once signed, verify the signature: /usr/libexec/ApplicationFirewall/socketfilterfw -v /Applications/MyApp.app/Contents/MacOS/myapp Once signed, trust the application using the –add option: /usr/libexec/ApplicationFirewall/socketfilterfw --add /Applications/MyApp.app/Contents/MacOS/myapp To see a list of trusted applications. You can do so by using the -l option as follows (the output is pretty ugly and needs to be parsed better): /usr/libexec/ApplicationFirewall/socketfilterfw -l If, in the course of your testing, you determine the firewall just isn’t for you, disable it: /usr/libexec/ApplicationFirewall/socketfilterfw --setglobalstate off To sanity check whether it’s started: /usr/libexec/ApplicationFirewall/socketfilterfw --getglobalstate Or to manually stop it using launchctl (should start again with a reboot): launchctl unload /System/Library/LaunchAgents/com.apple.alf.useragent.plist launchctl unload /System/Library/LaunchDaemons/com.apple.alf.agent.plist If you disable the firewalll using launchctl, you may need to restart services for them to work again.